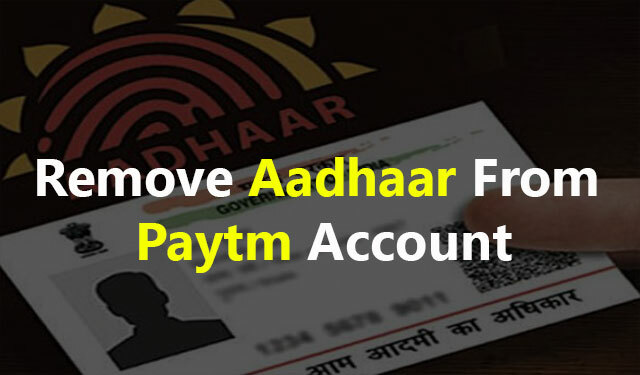 Tech mahiti: How To Remove Aadhaar From Paytm Account? How To Remove Aadhaar From Paytm Account? How to Remove Aadhaar From Bank Account? No longer need to link Aadhaar Card with a Bank Account and no bank customer can speak of Aadhaar link. No educational institution can call the Aadhaar card. No mobile or private company can ask for Aadhaar. Supreme Court has ordered the closure of the decision to link Mobile to the base. Based on all of us, all of the personal information is recorded, there is no need to tell anyone about it and together you will also know about data leaks and fraud on the Internet. The Supreme Court has taken this very right decision. Now you have to delete the Aadhar number from your bank account and you do not have to attach the basis with the bank account in Future. So you have to follow some of the necessary tips. How do I remove Aadhar From Paytm? As we all have done the Paytm KYC verification and now according to the order of the Supreme Court, payment bank of any kind does not require KYC verification in the Wallet. Now we can delete your KYC Verification details. To delete Aadhar number from Paytm, we will have to go to our Paytm profile section and click on the 24 * 7 Help Option given on it. Clicking Help will show us many options, we need to click on More products & services option below and click on Profile & KYC option. In the KYC option, we must click on Issue while placing KYC Request Option. Here we will first need to click on the option, I am unable to locate the KYC icon on the Paytm app to place KYC request. After going over here, we will get the option of Message Us. Click here, we can request to delete your KYC Detail from our Paytm. Paytm will de-link your Aadhaar from the Supreme Court order. If you have opened your account in a bank such as State Bank of India (SBI), Punjab National Bank (PNB) and have linked Aadhaar number, then you can remove the Aadhar card from the bank account in this manner. We will soon be ordered to link all banks (SBI, PNB, ICICI, HDFC, Axis, Allahabad etc.) to Aadhaar Card, after which we can remove your Aadhar Card from Bank. With this, we can submit the application directly to the Bank branch. Friends, Paytm, Banks or any telecom companies need not give the Aadhaar card anymore and no one can ask you. If your have already been based card Link you have your medium Application Online, Customer Care helpdesk or Offline Application Aadhaar Card Delete then can request to get us this related to any information you have about it Will get to see on TechYukti early.